MANILA, Philippines - Two typhoons were formed over the Pacific Ocean in the past days with 'Lando' (international name: Koppu) could put Northern Luzon in danger due to life-threatening flooding from days of torrential rainfall and damaging winds. 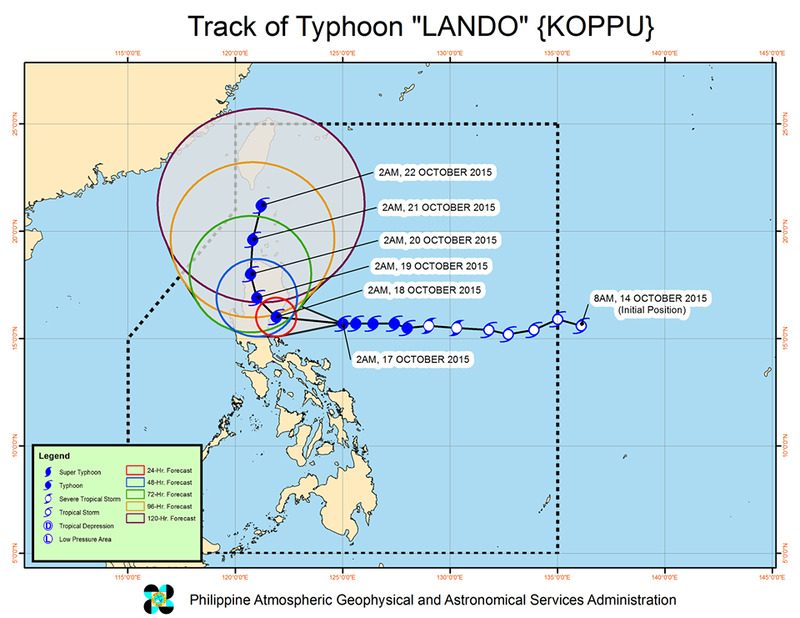 A report from the state weather bureau PAGASA says that Typhoon Lando may gain more strength in the Pacific. Another typhoon which is still outside of the Philippine area of responsibility (PAR), with international name "Champi," is slowing Lando. "'Yung tinatawag nating Fujiwara effect, kumbaga nagkakaroon ng interaction 'yung dalawa... Bumabagal ang pagkilos nito (Lando)," he said. Champi is the 25th named storm of 2015 in the northwest Pacific Ocean and became the 16th to reach typhoon strength. 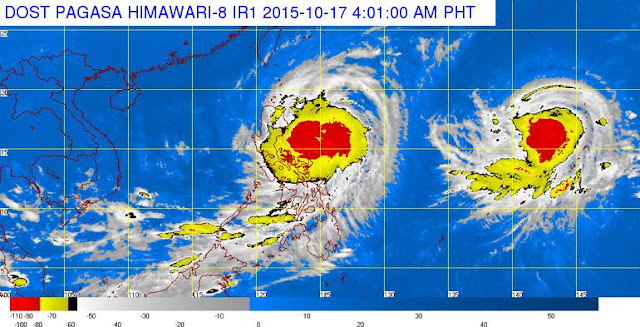 PAGASA says Champi is not expected to enter PAR. An Accuweather report said that the greatest threat the Northern Philippines will be life-threatening flooding from days of torrential rainfall due to Typhoon Lando. "A total of 300 to 600 mm (12 to 24 inches) of rain is expected to be widespread. There will even be localized amounts upwards or in excess of 900 mm (36 inches). Such rain is sure to trigger severe and life-threatening flooding and mudslides," Meteorologist Adam Douty said. "Residents in Baguio, Bangui, Aparri, Tuguegarao and Pagudpud are among those across northern Luzon who are being urged to prepare for the impending severe flood danger," the report added. In its 5:00am update today, October 17, 2015, weather central said that 'Bagyong Lando' has maintained its intensity and continues to increase its threat to Isabela-Aurora area. 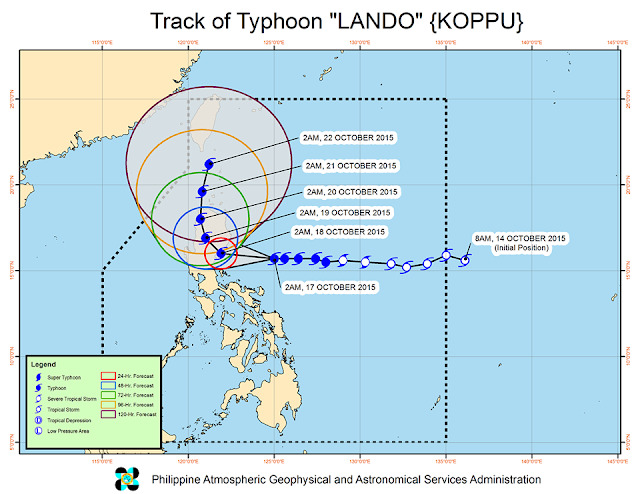 Typhoon Lando is expected to make landfall over Aurora-Isabela area between Saturday night and Sunday morning. At 4:00 AM today, the center of Typhoon Lando was located based on all available data including Baler Doppler Radar at 335 km East of Baler, Aurora (15.7°N, 124.7°E). The maximum sustained winds of 150 kph near the center and gustiness of up to 185 kph. It is forecast to move West at 12 kph. Public Storm Warning Signal No. 3 (121-170 kph Expected in 18hrs.) is up over the areas of Aurora, Quirino, Isabela and Polillo Island. Public Storm Warning Signal 1 (30-60kph Expected in 36 hrs.) is up in Batanes, Pangasinan, Bulacan, Pampanga, Tarlac, Zambales, Bataan, Rizal, Batangas, Laguna, Southern Quezon, Cavite, Albay, Camarines Norte, Camarines Sur, Catanduanes and Metro Manila. Fisherfolk are advised not to venture out over seaboards of Luzon, Visayas and the eastern seaboard of Mindanao.